Project Zero: Stepping into character. I am writing up my reflections from the Project Zero conference I attended last October - Project Zero Perspectives: Learning Together, Leading Together. See my last post on Art and Contemporary Issues here. We start out activity by writing everything we saw in this image, (to be honest I may have just walked past this painting if I was in a gallery by myself, so I was surprised about how much was going on in the image. It definitely made me more aware that I do that, and gave me a little bit of guilt, which will make me absorb more when walking around a gallery... I am definitely guilty of charging through a gallery, and just spending time with the artworks that appeal to me). Although we didn't do a 'see, think, wonder' activity for this part, from doing those regularly I could definitely see that my notes fell into those categories! We shared what we saw with the group. People definitely bought their own feelings and experiences in through their observations (with people having completely different interpretations of the characters, mood etc). We then did a ‘think, pair, share’ activity where we firstly wrote down as many questions as we had, we then shared with a partner and finally we all gave one question out to to the group. The questions ranged in everything from the characters emotions, their roles and their locations, through to the artist’s intentions and questions about the painting itself, (you may notice it has been re-worked a lot..and Picasso forgot one of the characters legs…). We mostly discussed the characters and their roles within the group. 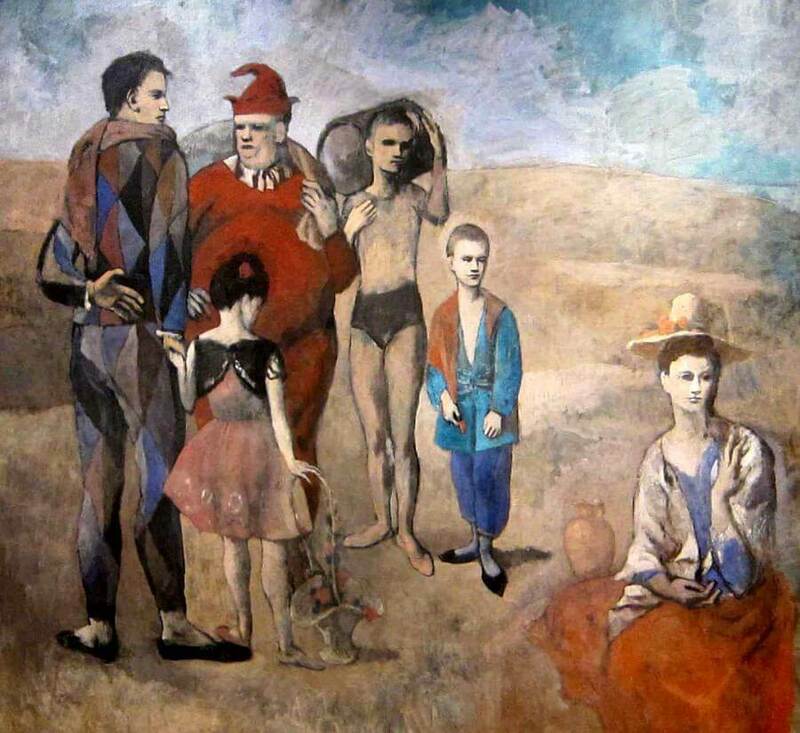 We learnt a little more about the context of the painting - Picasso was living next to a circus in Paris and would often go there three to four nights a week, he was in the middle of is rose period and also the harlequin is thought of as a self-portrait. We then shared out….and then ran out of time! I probably would have never given much thought to this painting, so I appreciated having a long time to look at it to really absorb and then question what I was seeing. Having a lot of time to really think about the characters and how they were feeling and what exactly was happening was also very interesting. I don’t think I am very articulate or good at storytelling, but this really brought out a lot of creative ideas. Although I enjoyed it, I definitely would want to relate this activity more to global issues. I would really like to do the same activity, but with photographs. I can see Facing History and Ourselves doing a similar activity to look at stereotypes, as well as a tool for empathy. Using perspective taking is a fantastic tool for building empathy and understanding. Protestors kneel with their hands up during demonstrations on Ferguson. A Libyan coast guard officer stands on a boat during the rescue of 147 illegal immigrants attempting to reach Europe off the coastal town of Zawiyah, Libya. Second Chance Greyhound Prison Training. Overall this was a good activity for me, as it helped me slow down my thinking and really try to understand the different characters and their relationships from the images. The activity was great, but it definitely would have appealed to me more if it was related to global issues or social justice. What other images would you do this activity with? Send me your ideas!